My Chinese drawing classmate Jane inspired me to try out this dim sum dish. Why are they called pearl meatballs? 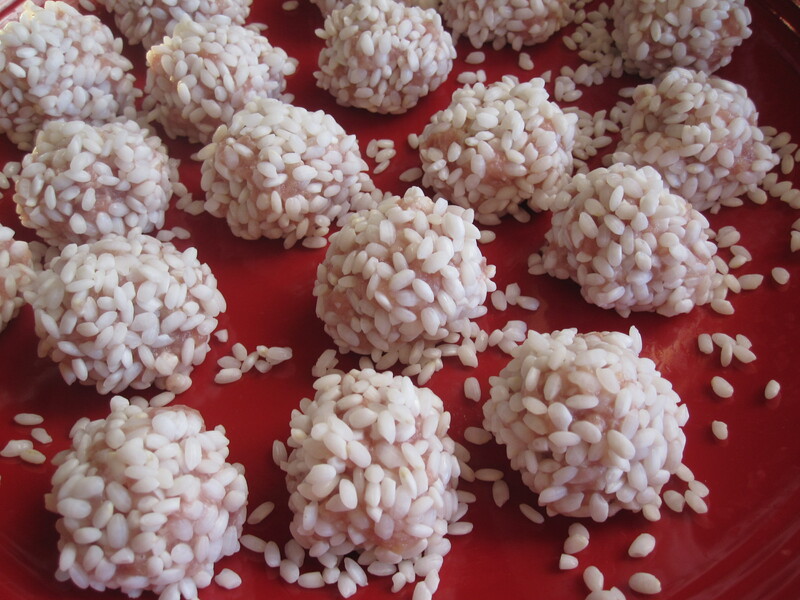 This is because after steaming, the rice coating makes the meatballs look like giant pearls from a distant. The first time I made it, the meatballs were gigantic, and way too salty. This time around, they all turned out pretty good. I’m happy with the result, so… time to enjoy my pearls! 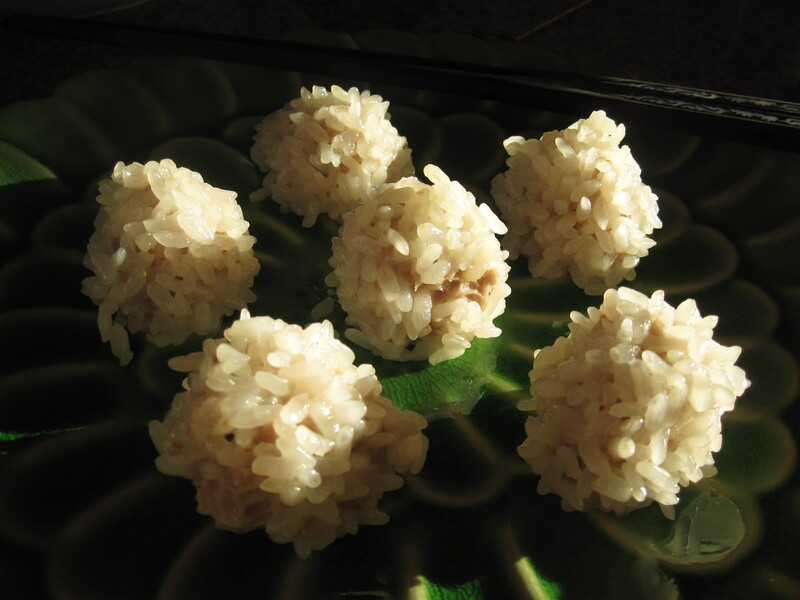 After soaking glutinous rice, drain out as much water as possible. Transfer to a deep dish plate. In a deep bowl, season the pork with the meat seasoning, then add in remaining ingredients(except egg white) to mix well. Use a pair of chopsticks/wooden spoon/flat rice scooper, stir the meat in a circular motion(same direction), until it binds and turns sticky. Add in egg white and continue stirring motion, until it mixes well and sticky again. Scoop some ground pork , lightly shape to a small ball of fish ball size or US quarter(25 cents) size. Roll the meatball in the rice so the rice coats the surface, press to stick the rice. Shape it to a ball again if necessary. Repeat until all meat are finished. 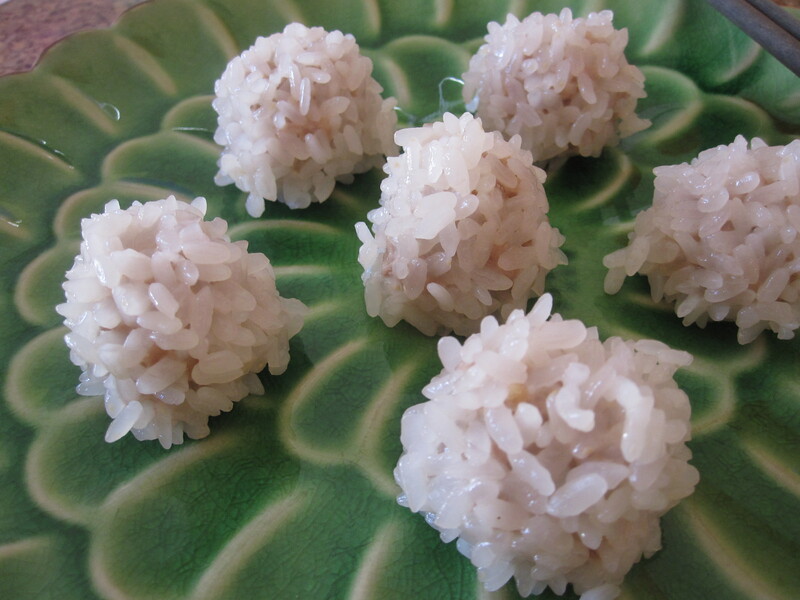 Steam tray: In my first trial, I steamed pearl meatballs in a greased metal plate, but because there’s no hole on the plate for the liquid to drain during steaming, the bottom of my pearls were all mushy rice. So, I thought of steaming the pearls directly on the steam tray with holes, this way the liquid can drip back to the boiling water below, keeping the rice from getting mushy.